Given the Republican rumblings in Congress, Celia Cole, the CEO of the Texas Food Bank Network, figured it was only a matter of time before Fox News launched an attack on SNAP, the Supplemental Nutrition Assistance Program better known as food stamps. This summer, House Republicans held up a bipartisan Senate Farm Bill with demands for $40 billion in cuts to the food stamps program, as well as work and drug testing requirements for beneficiaries. (A previous bill with only $20 billion in cuts failed in June because they were deemed not deep enough.) The ethos espoused by House bill backers is that the best way to help the poor and hungry is to let them help themselves. Legislators also cited misuse and fraud as pressing concerns. Then, on Friday, Fox News aired a special report titled “The Great Food Stamp Binge.” The network inferred that the dramatic rise in food stamp recipients, from 28 million to 47 million since 2008, was a result of the Obama administration’s welfare society and an affront to American self-reliance and mettle. The surge in people on food stamps, the special argued, has nothing to do with our crappy economy and the working poor who need help buying food for their families. Instead Fox posited that it could be a conspiracy to grow the size of government. Fox interviewed an unemployed beach bum and aspiring rock star in La Jolla, California who bought a lobster with a SNAP card. The special also pointed to a social worker acting on behalf of the USDA who’s allegedly tearing down “mountain pride” in Appalachia—the mindset that families should tighten their belt straps (literally) before relying on government help—by getting residents in Ashe County, North Carolina to use SNAP funds on seeds for their gardens, a sort of gateway drug to wider food stamp usage. The Fox special was catnip for conservative bloggers and live bait for other media outlets. “Normally we don’t justify these kinds of reports with a response,” Cole told the Observer. But in this case, Cole said, the Texas Food Bank Network felt compelled to address the misinformation. “Too many people judge the poor without ever walking in their shoes,” she said. The Fox special, she added, failed to interview anyone suffering from poverty and lack of access to nutritious food. Moreover, the food stamps program doesn’t serve as a long-term form of dependency for most recipients, Cole said in a follow-up interview. The average participant receives benefits for 19 months, and new applicants typically receive benefits for just nine months. Cole said the program is correlative to people’s income—when it drops, they go on food stamps, and when it rises again, they go off the program. Shortly before Congress adjourned for its August recess, House Republican leaders disclosed that they plan to move a bill in early September that doubles — to $40 billion over ten years — their proposed cuts to SNAP (the Supplemental Nutrition Assistance Program, formerly food stamps) and immediately cuts 2-4 million more low-income individuals from the program. The new cuts come primarily from eliminating waivers that states can use, during periods of high unemployment, to ease the severity of a harsh rule that limits SNAP to three months of benefits out of every three years for people aged 18 to 50 who aren’t raising minor children and are unemployed, regardless of how hard they are looking for work. Under the new House Republican proposal, if such individuals can’t find at least a half-time job, they will summarily be thrown off the program after three months — irrespective of how high local unemployment is. The individuals in question are among the poorest people in the United States. SNAP program data show their average income is just 22 percent of the poverty line, about $2,500 a year for a single individual. For most of them, SNAP is the only state or federal income assistance available. On average they will receive about $160 a month in SNAP benefits in fiscal year 2014. The individuals at risk of losing basic food assistance are a diverse group. More than 40 percent are women. One-third are over age 40. Among those who report their race, about half are white, a third are African American, and a tenth are Hispanic. Half have a high school diploma or GED, and another fifth have some college education. They live in all areas of the country, and among those for whom metropolitan status is available, about 40 percent live in urban areas, 40 percent in suburban areas, and 20 percent in rural areas. As a result of the proposed cuts, many of these individuals would fall deeper into destitution. Some would likely experience hunger as well as homelessness; money spent on food isn’t available to pay the rent, and with income this low, it can be very difficult to do both. The new cuts would come on top of the $20 billion in cuts in the farm bill that the House Agriculture Committee approved on May 15. Congressional Budget Office estimates show those cuts would throw nearly 2 million other low-income people off SNAP, primarily working families and elderly individuals, and reduce benefits for hundreds of thousands of others. The cuts would also come on top of an across-the-board SNAP benefit cut for all participants — including the 22 million children receiving SNAP — which will take effect on November 1 when a temporary provision of the 2009 Recovery Act ends. Now does everyone see why the Republican reactionaries at FOX tried so desperately and shamelessly to make that San Diego beach bum the poster child of food stamp recipients? That's why it's called "propaganda," folks! It's the same guilt-by-association technique that the political ruling class has been employing for years to demonize both the 9/11 truth movement and anti-NWO movement. Yet even people informed enough to know better fell hook, line and sinker for it anyway. FOX is to the banker-owned Republican Party what MSNBC is to the banker-owned Democratic Party -- an unofficial yet blatantly obvious public relations arm. Neither is a legitimate "news" organization. That's the bottom line. WASHINGTON -- A Republican proposal to cut food stamp spending by 5 percent would eliminate benefits for as many as 6 million Americans, according to an analysis by the Center on Budget and Policy Priorities, a liberal D.C. think tank. Republicans have said the forthcoming measure, which will combine stricter eligibility standards with new work requirements, will reduce Supplemental Nutrition Assistance Program spending by $40 billion over 10 years. "House Republican leaders haven’t formally released the language of their plan, but the information they have made available makes clear that the proposal will be very harsh, denying SNAP to at least four million to six million low-income people, including some of the nation’s poorest adults, as well as many low-income children, seniors, and families that work for low wages," the CBPP's Dottie Rosenbaum, Stacy Dean, and Robert Greenstein said in a report published Monday. A key part of the new legislation would stop states from waiving SNAP's work requirements for able-bodied childless adults, something more than 45 states currently do because of high unemployment. Working-age Americans without kids would have to either work 20 hours a week or engage in "work activities" that could include training or volunteering. "The House will consider common-sense measures, such as work requirements and job training requirements for able-bodied adults without children receiving assistance, that enjoy broad public support," Doug Heye, a spokesman for House Majority Leader Eric Cantor (R-Va.), said in an email on Monday. The Center on Budget claims it's inaccurate to say the forthcoming proposal includes work requirements. "In reality, they would terminate basic food assistance to people who would take any job or job training opportunity offered but cannot find one; the proposal doesn’t require states to provide jobs or job training and includes no added funds for these activities," the report's authors said. As I predicted in an earlier piece, the Republican move of separating the food stamps bill from the farm bill was nothing but a crafty ploy to preserve farm subsidies and then gut the Supplemental Nutrition Assistance Program (SNAP) at their leisure later. Unfortunately, I was right. The upcoming Republican plan to cut SNAP spending by $40 billion over 10 years will cut assistance for as many as 6 million Americans. That means 6 million people will be denied food when they need it. That is disturbing in itself but let's look at the rationale of the Republican stance to see if it makes sense. Part of the GOP's proposal includes tightening work requirements for able-bodied childless adults, who they believe should be held to a higher standard. Fair enough. After all, if you are capable of working for a living, then why should you burden the system with feeding you? The only problem is that there is a very good reason that 45 states have relaxed this work requirement in recent years -- including several Republican states, and that has to do with the high rate of unemployment in America right now. To expect someone who can feasibly work to do so is perfectly reasonable, but workers do not create their own jobs. If there are no jobs in our economy, then how can even an able-bodied childless person be expected to find work? They cannot, and so to hold Americans' feet to the fire on this is simply wrong. Plus, the emphasis on the work requirement is based on the belief that many food stamps recipients are freeloading off the system, but that is false. The fact is that 80 percent of SNAP recipients who can work actually do work! Not to mention that the Republican proposal would also hurt senior citizens and working families, who cannot afford food because of high housing and child care costs. But even if you forget about right and wrong, since that usually does not sway the GOP anyway, in purely practical terms too the cuts to the food stamps program are indefensible. For years I've been imploring the Austrian- and Chicago School-dominated "Right" to stop arrogantly and mindlessly blaming the poor for their own poverty, and to stop waxing hysterical about the figurative speck that's in the collective eye of social welfare recipients while directing only a small fraction (if even that much) of that same moral outrage at the comparative 20-ft beam that's in the collective eye of the recipients of corporate welfare (Wall Street mega-banks, derivatives speculators and war profiteers, of course, being among the top recipients). Because all this does is give "left cover" to the corporate fascist agenda of Wall Street Democrats like Barack Obama, Jim Himes and Nancy Pelosi, thereby strengthening them politically. Unfortunately, and much to the giddy delight of Obama and the left-wing reactionaries who serve him, demonizing food stamp recipients all day -- and painting tens of millions of struggling Americans with the same stereotypical brush -- is apparently so much fun, and so perversely intoxicating to the ego, that right-wing reactionaries simply can't help themselves. They just can't resist giving Wall Street Democrats still more convenient foil against which to define themselves in the eyes of the bottom "47%." Leave it to Republican reactionaries to prove the above point yet again! Speier went on, using particular examples of members of Congress who went on sponsored trips and spent large amounts of money on food and lodging. “Let me give you a few examples: One member was given $127.41 a day for food on his trip to Argentina. He probably had a fair amount of steak,” she said. “Another member was given $3,588 for food and lodging during a six-day trip to Russia. He probably drank a fair amount of vodka and probably even had some caviar. That particular member has 21,000 food stamp recipients in his district. One of those people who is on food stamps could live a year on what this congressman spent on food and lodging for six days,” she added. Who voted for and against the food stamp bill? The House narrowly approved a measure Thursday evening that would cut about $39 billion in funding for the Supplemental Nutrition Assistance Program — better known as food stamps — over the next decade. The vote came at the start of a contentious 10-day stretch that will see the House and Senate fight over a short-term spending plan and begin another battle over raising the federal debt limit. Final tally: 217 to 210. How many Republicans voted for the bill? : 217. How many Republicans voted against the bill? : 15. How many Democrats voted against the bill? : 195. How many Democrats voted for the bill? : 0. How many lawmakers didn’t vote? : 6. How many seats are vacant? : 2.
Who were the Republicans that voted against the bill? : Reps. Peter King (N.Y.), Shelley Moore Capito (W. Va.), Chris Gibson (N.Y.), Walter Jones (N.C.), Richard Hanna (N.Y.), Chris Smith (N.J.), Frank LoBiondo (N.J.), Don Young (Alaska), Frank Wolf (Va.), Mike Fitzpatrick (Pa.), Jeff Fortenberry (Neb. ), Michael Grimm (N.Y.), Patrick Meehan (Pa.), Gary Miller (Calif.), David Valadao (Calif.). ^^ "Look!" exclaim hyperventilating blame-the-victim-firsters, "Walter Jones has been a freedom-hating collectivist in disguise all this time! He's a traitor to the cause of 'liberty!' Austrian School, save us!" My respect for Walter Jones, which wasn't that low to begin with, just skyrocketed. You did the right thing, Walter. Don't let anyone tell you otherwise! Sticking to their promise, House Republicans passed nearly $40 billion in cuts to the nation's food stamp program, or the Supplemental Nutrition Assistance Program (SNAP). In a close vote, 217-210, with no help from any Democrats and even 15 members of their own party voting "NO," congressional Republicans passed deep cuts to a program that is vital especially in an economy that is in a slow recovery. Understanding why Republicans are obsessed with cutting programs for low-income Americans isn't too difficult, but it's hard to agree with. Republicans hold an ideology that if you can't make it on your own, the government shouldn't be there to help hold you up. Pushing the false narrative that anyone using government services is lazy, millions of Americans side with the GOP, wondering why those "lazy" Americans won't just get a job and make it on their own. Looking deep into the program itself, here are four reasons why cutting the food stamp program is bad for the economy while debunking common Republican misconceptions. Republicans often claim that food stamp recipients are mostly lazy Americans who don't want to work, the reality is much different. According to snaptohealth.org, half of the people using the SNAP program are children under the age of 18 years old. Nearly 70 percent of those under the age of 18 are living in a single parent household. The research also notes that over 25 percent of benefits also go to disabled Americans and senior citizens. "SNAP eligibility rules require that participants be at or below 130% of the Federal Poverty Level. Recent studies show that 49% of all SNAP participants are children (age 18 or younger), with almost two-thirds of SNAP children living in single-parent households. In total, 76% of SNAP benefits go towards households with children, 16% go to households with disabled persons, and 9% go to households with senior citizens. "According to demographic data, 43% of SNAP participants are white, 33% are African-American, 19% are Hispanic, 2% are Asian, and 2% are Native American." Over 95 percent of SNAP payments were considered accurate in 2012, which is the highest rate of accuracy in the program's history. Research shows that only 1 percent of benefits were exchanged for cash, showing a very minimal amount of fraud and waste. "According to a recent USDA analysis, SNAP reached a payment accuracy of 96.19% in 2012 (the highest that the program has ever seen). Trafficking rates—the number of benefits exchanged for cash—are at 1%. There is always room for improvement, but the integrity of the SNAP program is currently functioning at the highest level it has ever seen." According to the most recent date from the Census Bureau, the SNAP program lifted 4 million people out of the poverty in 2012. As the Huffington Post points out, in addition to 4 million people being lifted out of poverty, millions more were considered less poor because of the program. "In addition to keeping some people out of poverty, SNAP also made tens of millions of people less poor in 2012. For these individuals, the program reduced the gap between their income and the poverty line and made them better able to afford a basic diet. "SNAP is highly effective in reducing the extent and depth of poverty and reducing hunger, but millions of Americans still struggle to afford food. Data released earlier this month by the U.S. Department of Agriculture showed that 17.6 million American households lacked access to adequate food at some point in 2012 because they didn't have enough money or other resources to meet their basic food needs." Republicans often promote the message that those on food stamps are taking that money and buying high luxury items, going out to fancy dinners and purchasing an elaborate wardrobe. The reality is that the average SNAP client receives a monthly benefit of only $133 while the average household receives a monthly payment of $289. The Republican-controlled House of Representatives voted yesterday to cut $40 billion from food stamps. In doing so, they decided to rewrite Marie Antoinette. It's been amusing to read House Republicans try to flim-flam the public that this is all a Good Thing for the poor and destitute. The twisted logic is that people on food stamps mostly want jobs, so this $40 billion savings is all about getting them those jobs! Cool, no? "This bill is designed to give people a hand when they need it most," said House Majority Leader Eric Cantor (R-Va.) "Most people want a job/ Most people want to go out and be productive so that they can earn a living, so that they can support a family, so that they can have hope for a more prosperous future." Mind you, left out of his heart-rending hosannah is how this $40 billion cut in food stamps is actually going to get those destitute people jobs. 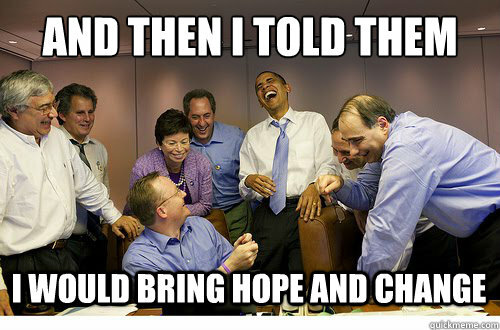 There's no jobs plan on the table from Republicans. There's not even much discussion of one from Republicans that I've heard. In fact, Republicans have seemingly preferred to cut jobs, like teachers, and police and fireman, and nurses, and road construction workers. After all, when GOP politicians vote to cut programs, it's jobs that they're cutting. "They want what we want," said Rep. Cantor. Well, yeah, that would be true, but only if "they" also wanted to screw themselves, but I tend to doubt it. Well, one big reason I think this is because of words directly out of the mouths of Republicans themselves. And hey, if you can't trust words out of the mouths of Republicans, who can you really trust, y'know?" "If you're a healthy adult and don't have someone relying on you to care for them, you ought to earn the benefits you receive," said Rep. Tim Huelskamp (R-Kan.). "Look for work. Start job training to improve your skills or do community service. But you can no longer sit on your couch or ride a surfboard like Jason in California and expect the federal taxpayer to feed you." Right. Because all that people in Kansas or Birmingham or Denver or Tennessee like to do is surf. The Congressman is disingenuously referring to a story aired by Fox News about a fellow on food stamps named Jason Greenslate who does like to surf, rather than work. Well... y'know, I'm sick of garbage like this. I think it's time that we find the handful of most utterly reprehensible and excessive rich people on Wall Street, CEOS and bankers throughout the nation -- and I have a sneaking suspicion that three or four exist, don't you? -- and point to them as representing ALL of corporate America, and why no business needs or deserves tax credits or tax cuts. By now, anti-food stamp crusader Rep. Stephen Fincher is notorious for raking in millions in farm subsidies while misquoting the Bible in favor of deep cuts to the Supplemental Nutrition Assistance Program. But let's not forget that he's far from alone among House Republican in voting to take food from the poor while happily taking farm subsidies for himself. Another Republican congresswoman who voted to make cuts to the food stamp program was Rep. Vicky Hartzler of Missouri. Her farm received more than $800,000 in Department of Agriculture subsidies from 1995-2012. In 2001, her farm received $135,482 in subsidies. Rep. Marlin Stutzman, who claimed that the bill was about "how many families are lifted out of poverty and helped back on their feet," as if there was any possible way it would do that, got $200,000 in farm subsidies for a farm he co-owns with his father. Evil. Disgusting. Heartless. There's really no way to exaggerate how awful these people are. As lawmakers on Capitol Hill continue to battle over whether or not to cut funding for federal food assistance programs, House Republicans are wielding a bizarre new weapon in their attempt to gut government services that help the poor: bad Bible skills. Cramer’s sloppy theology is only the latest in a series of attempts by Republican House members to use the Bible to justify cutting programs that help feed the poor. Rep. Stephen Fincher (R-TN) also cited the 2 Thessalonians passage to support cutting SNAP at a hearing in May, a move that was widely condemned by religion writers, Tennessee faith leaders, and faith-based activists such as Rev. Jim Wallis of the Sojourners, a Christian advocacy group. Rep. Doug LaMalfa (R-CA) quoted Ephesians 2:8-9 at the same meeting, erroneously arguing that scripture instructs followers to care for the poor only as individuals instead of through government programs. Finally, in September, Rep. Reid Ribble (R-WI) went so far as to publicly reprimand Sister Simone Campbell—a Catholic nun and executive director of NETWORK, a Catholic social justice lobby—as she testified before House Budget Committee on the merits of government programs such as SNAP. “What is the church doing wrong that they have to come to the government to get so much help?” Rep. Ribble asked. Taken together, the comments made by these Republican lawmakers represent dangerous theology and even worse policy. They collectively argue that God somehow believes that people are poor because they deserve it – that is, because they refuse to work – and that churches and private charities have enough resources to feed America’s hungry without the help of government programs such as SNAP. Caring for the poor also resonates with those in pews. When polled, huge majorities of every major American religious group agree that the government should do more to reduce the gap between the rich and the poor, and even the majority of White Evangelicals oppose cutting federal programs that help the impoverished. The presumption that churches and private charities can somehow shoulder the massive burden of feeding American’s poor is also patently false. Many faith-based charities already rely on government funding to function. (Catholic Charities, one of largest charities in the country, gets almost 70 percent of its operating budget from federal funds.) When Congress threatened to slash funding for SNAP last year, Bread for the World, a Christian nonprofit organization dedicated to eradicating poverty, estimated that the cuts would cost every church in America an extra $50,000 every year for the next ten years just to cover the additional charge of feeding more of America’s poor. Perhaps most offensive and inaccurate of all, however, is the fiction embedded within the comments of these House Republicans: that recipients of food stamps are social moochers who simply refuse to work. In reality, most of the country’s 47 million food stamp recipients are children or the elderly, as well as many military veterans and disabled Americans. Recipients of food stamps also often include those among America’s 8.9 million “working poor” – people who work full time but still rely on programs like SNAP to feed their children and families. Furthermore, many of the country’s 17 million hungry families have earnings in excess of the poverty line and would be removed from food assistance on which they depend if the House-passed SNAP bill were to become law. The theology of these House Republicans is also plagued by hypocrisy: Despite his resistance to offering breaks to the working poor, Rep. Cramer’s North Dakota district is the single largest recipient of farm subsidies in the nation, having received $10.4 billion in agricultural subsidies from the U.S. Department of Agriculture from 2005 to 2012. The same is true for Rep. Fincher, who personally collected $3.48 million in federal farm subsidies from 1999 to 2012. The way the program to provide the poor with the bare minimum of daily nutrition has been handled is a metaphor for how the far right in the House is systematically trying to take down the federal government. The Tea Party radicals and those who either fear or cultivate them are now subjecting the food-stamp program to the same kind of assault they have unleashed on other settled policies and understandings that have been in place for decades. Breaking all manner of precedents on a series of highly partisan votes, with the Republicans barely prevailing, the House in September slashed the food-stamp program by a whopping $39 billion and imposed harsh new requirements for getting on, or staying on, the program. The point was to deny the benefit to millions. Hardly any other federal undertaking – with the exception of the Affordable Care Act – has attracted more hostility from the far right than the food-stamp program. As recently as the mid-Sixties, actual hunger and starvation existed in this country on a significant scale, particularly in the Deep South and Appalachia. In 1967, Robert F. Kennedy took a widely covered trip to the Mississippi Delta, where he was quite evidently shocked at the sight of listless babies with distended bellies who were unresponsive to his touching them or trying to get them to laugh. That same year, a group of doctors took a foundation-sponsored trip to Mississippi and reported, "In child after child we saw: evidence of vitamin and mineral deficiencies; serious untreated skin infestation and ulcerations; eye and ear diseases, also unattended bone diseases secondary to poor food intake; the prevalence of bacterial and parasitic diseases. . . ."
In the years after these devastating revelations, two farm-state senators of different philosophies on many issues – South Dakota Democrat George McGovern and Kansas Republican Bob Dole – joined together to strengthen the program and extend it to more people in need. Over in the House, Thomas Foley, a Democratic congressman from Spokane, Washington – a major wheat­growing area – and later House speaker, was the real legislative hero of the program. In 1979, 12 years after the original report calling attention to the appalling hunger in the Deep South and Appalachia, the Field Foundation sent another medical team to roughly the same areas, and it found that despite no sizable improvement in the condition of poverty, there had been a dramatic reduction in hunger and malnutrition as a result of food stamps and other nutrition assistance. The data shows that while a significant number of nonelderly households left the program as their income improved, the group whose participation had increased the most was the working poor. "Food stamps are largely responsible for the near-elimination of the severe hunger and malnutrition that was widespread in many poverty-stricken areas," says Bob Greenstein, president of the Center on Budget and Policy Priorities and a bearded, Old Testament-like figure who ran the program during the last two years of the Carter administration and is passionate about it. "Were it not for this program, we would see a lot more chronically hungry people and more illness related to malnutrition and undernutrition." Food stamps are far from an extravagant benefit. The average allocation is $1.40 per person per meal. (Try it some time.) A few years ago, the program was renamed SNAP, for Supplemental Nutrition Assistance Program, to give it a more positive facade, but that headed off not a whit of anger at the notion that hordes of freeloaders were getting benefits they didn't deserve or were electing to become dependent on food stamps rather than get a job. In 1996, when Congress revised the separate welfare law, it also placed severe new restrictions on food stamps. Able-bodied adults who weren't raising children were limited to receiving food stamps for only three months out of three years if they weren't working at least 20 hours a week or participating in a job-training program. This grim rule applied no matter how hard they tried to find a job and even if they hadn't been able to get a slot in a training program. An exception could be made if they lived in an area of high unemployment and if their governor requested and received a federal waiver. The average income of these people is about $2,500 a year, or 22 percent of the poverty level. The job-training program that's part of the food-stamp law is modest, nowhere near the needed capacity, and other job-training programs the government offers are full, with waiting lists in many areas. But Republicans have resisted significant increases in training programs – if this hurts the economy or large numbers of individuals, so be it. First things first: Undermine Obama's presidency. In 2009, desperately trying to revive the economy from the crash and understanding that money for food stamps is money quickly spent, Obama proposed that the stimulus bill raise food-stamp benefits for all recipients. These increases were scheduled to die at the end of October. Thus the support level for it had been dropping significantly, despite the fact that the economy hasn't recovered to the extent that had been expected. The House's deep slash to the food-stamp program, combined with outlandish restrictions, arose from various impulses. There was, obviously, the long-standing animus within the Republican Party toward poor people, and that's been substantially intensified as a result of the transformation of the party, whose center of gravity has moved south and west. Moreover, a minority of the party in the House, backed by powerful and wealthy outside interest groups, has seized the reins by throwing terror into the ranks that if they don't conform to the Tea Party's agenda, they could face defeat in a primary challenge from the right in the next election. Bob Dole's and George McGovern's time is long gone. Neither the Senate, nor the House, nor American politics are anything like they were in their time. The Republican Party in the Senate contains no Jacob Javits, the late New York senator who fought to protect food stamps. Among the Democrats, there's no Edward Kennedy to champion the causes of the poor, to even enjoy doing battle for them. One of the few unabashed liberals, Tom Harkin of Iowa, is retiring after five terms. Harkin was born into modest means, which he has never forgotten – he needed no lectures about bootstraps. Adding to the ferocity of the attack on food stamps this year is that Tea Party members had promised that when they got to Washington, they would dramatically cut the size of government, but had little to show for it. Paul Ryan's much-touted budget was actually quite cautious in cutting entitlements in the near term. Medicare and Social Security were too popular, even among the Tea Party's own followers, for Republicans to stick their necks out on those issues. Medicaid is a component of the health-care-reform law, and therefore was being dealt with in another context. That left food stamps. The idea that the unworthy are cadging off the federal government – at a cost to the right-thinking taxpayers (who, of course, never, ever cheat) – goes deep in our national psyche. Ronald Reagan's frequent evocation of the "welfare queen" driving around in a Cadillac and the "strapping young bucks" said to be dining on T-bone steaks purchased with food stamps touched a racist nerve that is more prevalent in this country than we care to admit. Through this rhetoric, Reagan helped build the Republican Party's base in the South – with consequences that have lasted to this day. Newt Gingrich, it may be recalled, made a big issue of food stamps in his race for the 2012 Republican nomination, calling Obama the "food-stamp president." But despite Gingrich implying that lazy blacks were the personification of food-stamp recipients, only 22 percent of those who receive food stamps are black (33 percent are white). Of the roughly 47 million Americans on food stamps, nearly half are children. Policy by anecdote continued into this year's food-stamp debate. This summer, Fox News triumphantly presented an unemployed 29-year-old man from La Jolla, California, named Jason Greenslate, who liked to surf and play in a rock band, and who defiantly posed for the cameras buying lobster and sushi with the food stamps he got from the government. Fox then reportedly distributed the story to House members, and at least one member admitted that it influenced him to vote for a proposal to decimate the food-stamp program. Until the House took it up this year, the food-stamp program had mostly enjoyed bipartisan support from Capitol Hill. Of all the commissions, committees and ad hoc groups formed in the past few years to propose ways to cut the budget – the sainted (if overrated) Simpson­Bowles, Domenici­Rivlin, the "Gang of Six" – not one of them suggested cutting food stamps. What's more, the hue and cry about widespread food-stamp "fraud" is belied by the facts. The Agriculture Department reported earlier this year that only 2.8 percent of all food-stamp benefits had been provided to people who were ineligible or had received a larger payment than they should have – and it said that the majority of the overpayments had been the result of inadvertent mistakes by caseworkers or recipients. As for the widespread view that food-stamp recipients are selling food stamps for cash, the department reports that such trafficking involves only one percent of benefits. The fact that the size of the food-stamp program had more than doubled from nearly $38 billion in 2008 to $82 billion this year of course fed suspicions that there was a tremendous number of new cheaters, or that Obama had loosened the rules for getting on the program. Politicians who made such charges overlooked the fairly obvious fact that beginning in 2008 this country suffered the greatest recession since the Depression. A study published in August by the prestigious National Bureau of Economic Research found that most of that increase was attributable to the recession. The cuts are the result of the expiration of the 2009 Recovery Act’s temporary increase in food stamp assistance, which neither the Democrats nor Republicans proposed seriously proposed to prevent. The expiration of the extension was not scheduled to take place till 2015, when SNAP benefits are slated to increase. But congressional Democrats used $14 billion that was set aside for food stamps to fund other legislation. In 2010 the Democrats promised to restore the funding before the aid extension expired. The share of food stamp recipients who are working has risen significantly. Nearly one third of SNAP recipients were working in 2010, up from less than 20 percent two decades before. Of those who do not work, the vast majority are disabled, elderly or under age. 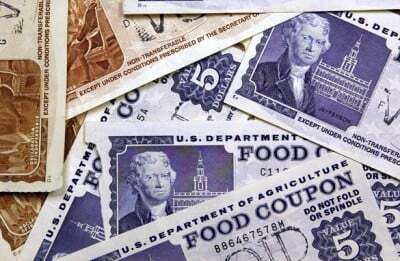 The number of people who receive food stamps will continue to rise through 2014, according to projections by the Congressional Budget Office. The typical household receiving SNAP had an income of $731 per month, or about $8,800 per year, not counting SNAP benefits, according to the Congressional Budget Office. The average SNAP payment per household that year was $287, or $4.30 per person per day. Over 21 million children—more than 1 in 4—live in a household that receives SNAP benefits, according to the CBPP report, and nine million people with disabilities receive SNAP benefits. The Democratic and Republican parties are planning even more draconian cuts to SNAP. The Democratic budget passed in the Senate earlier this year cuts over $4 billion from the program, and the Republican House of Representatives voted last month to cut nearly $40 billion from SNAP over ten years. The Republican proposal would force adults between 18 and 50 to either work or attend work training in order to reapply for benefits, and would also institute drug testing for recipients. If the Republican proposal were accepted, it would cut 3.8 million people off the program in 2014. Food assistance benefits for over 45 million Americans will be slashed starting this Friday, in the first-ever nationwide reduction in benefits under the US government’s Supplemental Nutrition Assistance Program (SNAP), popularly known as food stamps. The cuts total $11 billion over the next three years and amount on average to a month’s worth of food assistance. They will mean yet more privation for millions of working people, including the poorest and most vulnerable members of society—children, elderly people, the unemployed, the disabled and new mothers. That this brutal cut takes place under conditions of continuing mass unemployment and economic slump, with record numbers of people living in poverty and homelessness and hunger on the rise, testifies to the ruthlessness of the American ruling class. The callous indifference of the media and the entire political establishment, beginning with the Obama White House, to the suffering of broad layers of the population is reflected in their virtual silence on the imminent cutback in benefits. As far as the corporate-controlled media is concerned, snatching food from the mouths of hungry children is not even worth reporting. As for the politicians, Democrats as well as Republicans are saying virtually nothing because there is a bipartisan agreement to impose the cuts. Meanwhile, the government bailout of Wall Street and corporate America continues unabated. The Federal Reserve is expected this Wednesday to announce the extension of its $85 billion-a-month subsidy to the stock market and the banks in the form of its “quantitative easing” money-printing operation. Trillions of dollars have been pumped into the financial markets and interest rates have been kept at near-zero to drive up share values to record highs in the midst of the deepest crisis in the real economy since the Great Depression. This channeling of social wealth into the coffers of the super-rich has produced the highest levels of social inequality in nearly a century. 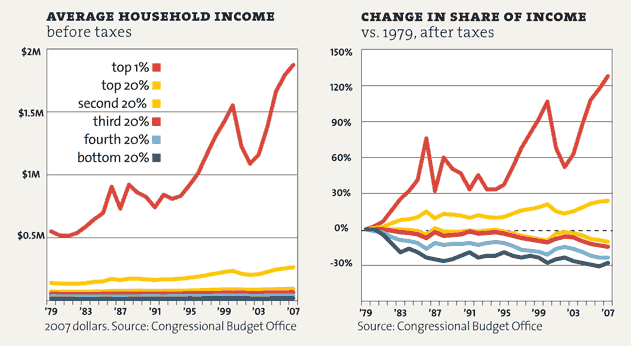 The American financial aristocracy is choking on its own wealth. Just last week,Forbes magazine reported that the ten highest-earning individuals in the US in 2012 each took in more than $100 million, with the top two making more than $1 billion apiece. The universal claim that there is “no money” to fund social services comes as corporations, awash in cash and profits, systematically avoid taxation. According to a USA Today report published Monday, one in nine corporations in the Standard & Poor’s 500 stock index paid no taxes last year. Among them are Verizon, which recently imposed new concessions on its workers, and the Murdoch-owned News Corp., which publishes the Wall Street Journal. The average effective tax rate on corporations in the S&P 500 was 12.6 percent—barely a third of the nominal corporate tax rate. The starkest indicator of the real state of the US economy in the sixth year of the crisis that erupted in 2008—and the clearest refutation of the official claims of a “recovery”—is the staggering growth in the number of people dependent on food stamps. Their ranks swelled by 70 percent between 2007 and 2012 and they continue to grow. The food stamp cuts scheduled for this week are the result of the expiration of the 2009 Recovery Act’s temporary increase in food stamp benefits. The increase was originally slated to last through 2015, when SNAP benefits are scheduled to rise, so as to ensure that there would be no reduction in benefits. But in 2010, congressional Democrats used $14 billion that had been set aside for food stamps to fund other measures, vowing to return the money before the benefit hike expired. With the unspoken sanction of the White House and congressional Democrats, that never happened. In current negotiations over a new farm bill, the Democratic-controlled Senate is proposing an additional $4 billion in cuts to the food stamp program over the next decade. The Republican-controlled House of Representatives has passed a bill that would cut $40 billion from SNAP and force adults between 18 and 50 to either work or attend work training in order to reapply for benefits, as well as instituting drug-testing for recipients. As always, the more draconian Republican proposal serves as the baseline for a “compromise” in which the Democrats, even as they posture as defenders of the poor, agree to increase the scale of cuts to a level that was likely agreed upon in advance by the White House and the two big business parties. The slashing of food stamp benefits comes just weeks after a 16-day government shutdown that set the stage for a bipartisan deal to extend most of the social cuts included in the $1.3 trillion “sequestration” process that began last March. Those cuts are on top of another $1 trillion in cuts pushed through during the 2011 crisis over the US debt ceiling. On January 1, the federal program that provides extended unemployment benefits for the long-term jobless is slated to expire, throwing millions more into poverty and outright destitution. All of this is preparation for a bipartisan assault on the core social programs that date from the New Deal of the 1930s and the Great Society of the 1960s—Social Security and Medicare. What is involved here is a social counterrevolution, the aim of which is to uproot and destroy every social gain won by the working class over the past century—from pensions and health benefits to public education and child labor laws. The bankruptcy of Detroit, which is being used to gut city workers’ pensions and strip them of their health coverage, along with the sell-off of public assets such as the art work at the world famous Detroit Institute of Arts, are a foretaste of what is coming nationally—and internationally. "Well, hey, if they can't afford to pay rent either because of the privilege-induced rent-wage gap or because there are simply not enough jobs to go around, and they're unable to grovel for 'charity' properly enough, then why not?" In August the city of Colombia, South Carolina, had a problem. A festival honoring the 50th Anniversary of the Civil Rights Movement was coming to town. They couldn’t be seen with all the homeless when guests arrived from all parts of the United States. So the city council held a vote and made homelessness a crime. The Columbia City Council unanimously approved the plan, creating special police patrols that would enforce “quality of life” laws involving loitering, public urination and other crimes not necessarily restricted to the homeless population. Those officers would then offer the homeless a choice: Go to jail for their homelessness or be shuffled to a 240-bed, 24-hour shelter on the outskirts of town, which they wouldn’t be allowed to easily leave. Despite some news from the Main Stream Media, and Glenn Beck, it looks like the city went out of their way to begin staffing the 240 bed, 24 hour, razor wire topped FEMA camp that was supposed to be used in case of a disaster according to FEMA. Remember, these areas do not exist according to the news media. However the FEMA site has the plans and the implementations of them. FEMA has even built them for cities such as Galeston, Houston, New York, Boston, New Orleans, and even Colombia. Strange for areas that don’t exist. South Carolina went through with the plans and they even caught the attention of the ACLU. In order for the homeless to “qualify” for the “temporary shelter” they would have to be one of the first 240 homeless to apply and wouldn’t be able to leave except by shuttle. They even went out of their way to remove some of the benches around the town so the homeless didn’t get comfortable and a hot line to call if you spotted homeless people for the residents. WASHINGTON — About 5,000 troops are among those affected by cuts to the federal food stamp program, according to the Pentagon. The Supplemental Nutrition Assistance Program (SNAP), better known as food stamps, is reducing benefits to about 47 million Americans. The benefit had been bolstered in 2009 by President Obama's stimulus bill, which is ending. Congress' failure to pass another farm bill has also chipped away at the benefit. For the military, the benefit goes primarily to young troops with families. Republicans will salute America's veterans Monday, while simultaneously trying to deny them benefits. In addition to reducing housing aid, and denying health care to vets, the GOP is also trying to remove thousands of vets from the food stamp program, known as the Supplemental Nutrition Assistance Program, or SNAP. At least 900,000 veterans rely on SNAP. The House Republican version of the farm bill, the five-year piece of legislation that funds nutrition and agriculture provisions, would slash funding for the food stamps program by nearly $40 billion and boot 2.8 million people off the program next year. That includes 170,000 veterans, who would be removed through a provision in the bill that would eliminate food stamps eligibility for non-elderly jobless adults who can't find work or an opening in a job training program. Veterans returning home from service have more trouble finding work than other folks, and rely more heavily on the food stamp program. The unemployment rate for recent veterans—those who have served in the past decade—is about 10 percent, almost 3 points above the national unemployment rate. War-related disabilities are one reason why. About a quarter of recent veterans reported service-related disabilities in 2011. Households that have a disabled veteran who is unable to work are twice as likely to lack access to sufficient food than households without a disabled service member, according to the nonprofit Center on Budget and Policy Priorities. ^^ Are the Republican reactionaries at FOX "News" covering this? If not, why do you suppose that is? They sure had plenty of time and resources to cover that San Diego beach bum, didn't they? Have you ever noticed that, when food for the poor becomes the target of government officials, you don't immediately hear hysterical screams of "class warfare," but when the ill-gotten gains of Wall Street mega-banks become the target of tax reform advocates, you do? Because the reactionaries who employ this obvious double standard love "liberty" so much? Or is it because they're more contemptuous of the poor and destitute than even the establishment Left is, and therefore can't resist giving Wall Street Democrats a continual public relations cloak of "left cover"? By outlawing dumpster diving, Houston is making life impossible for the most vulnerable. May 26, 2013 "Information Clearing House" -"Other Words" -- Whenever one of our cities gets a star turn as host of some super-sparkly event, such as a national political gathering or the Super Bowl, its first move is to tidy up — by having the police sweep homeless people into jail, out of town, or under some rug. But Houston’s tidy-uppers aren’t waiting for a world-class event to rationalize going after homeless down-and-outers. They’ve preemptively outlawed the “crime” of dumpster diving in the Texan city. In March, James Kelly, a 44-year-old Navy veteran, was passing through Houston on his way to connect with family in California. Homeless, destitute, and hungry, he chose to check out the dining delicacies in a trash bin near City Hall. Spotted by police, Kelly was promptly charged with “disturbing the contents of a garbage can in the [central] business district.” Seriously. “I was just basically looking for something to eat,” he told the Houston Chronicle. But, unbeknownst to both this indigent tourist and the great majority of Houston’s generally generous citizens, an ordinance dating way back to 1942 says that “molesting garbage containers” is illegal. Also, in 2012, city officials made it a crime for any group to hand out food to the needy in the downtown area without first getting a permit. It’s a cold use of legal authority to chase the homeless away to…well, anywhere else. Such laws are part of an effort throughout the country to criminalize what some call “homeless behavior.” And, sure enough, when hungry, the behavioral tendency of a homeless human is to seek a bite of nourishment, often in such dining spots as dumpsters. The homeless behavior that Houston has outlawed, then, is eating. Being poor could soon be a crime in the city of Miami. As though life weren’t already difficult enough for people who can’t afford regular housing, they could soon find themselves thrown in jail and their possessions confiscated if they’re caught engaging in certain everyday activities in public. Before the late 1990s, Miami police frequently arrested homeless people for such “crimes” as sleeping on park benches, eating on sidewalks, or congregating in public places. But in 1998, the city of Miami came to a landmark agreement, known as Pottinger v. City of Miami, whereby police officers were instructed not to arrest homeless people they caught committing minor “quality of life” offenses, but instead offer them a bed in a nearby homeless shelter. This new emphasis on providing homeless people with housing has been remarkably successful. In the 15 years since Pottinger, the number of people living on the streets has dropped from approximately 6,000 to 351, largely due to more shelters and support. Despite the program’s success, one Miami City Commissioner wants to back out of the deal and resume arresting homeless people for living on the streets. There’s a perpetual yuppie belief that society’s true failing isn’t the fact that half a million residents don’t have shelter, but that some do-gooders have the audacity to give homeless people food. The latest epicenter of this thinking is Los Angeles, where the City Council is considering a ban on feeding homeless people in public areas after complaints from nearby homeowners. Los Angeles has the second highest homeless population in the country, at 53,800 individuals, according to the 2013 Annual Homeless Assessment Report. And although the number of homeless people went down nationally over the past year, it increased by 27 percent in Los Angeles. For a quarter-century, the Greater West Hollywood Food Coalition, a group of community members who strive to meet homeless people “on their own turf, talk to them, and listen,” has served meals to the hungry every evening. On any given night, volunteers will hand out as many as 200 meals. A street ministry in Olympia, Washington focused on feeding the homeless is currently fighting attempts to have their work criminalized by the city. Ben Charles, founder of Crazy Faith Ministries, has fed the area’s homeless population every Thursday and Saturday from the same parking lot for the last two years, handing out as many as 5,000 meals per month. “As anyone who works with the impoverished will know, the best and sometimes the only way to help them is to meet them right where they are, rather than expect them to come to you,” said Charles. Although the group has had a long and highly supported presence in the area, complaints began arising regarding issues such as vehicle traffic being blocked from the growing number of hungry people coming to be fed. In October, Charles received notice from the Olympia Police Department that his group would no longer be allowed to use the lot, although unable to cite any law broken. “We and our street family are the public and we are peacefully gathering together for our common good. That is the birthright not only of Native people, but the constitutional right of all Washingtonians,” Charles said. Unsuccessful in getting the group to vacate, the city is now attempting to use red-tape and bureaucracy by passing a new ordinance that would require the group to purchase permits for any activity in city-owned parking lots. Using any lot without permission from the city government could result in fines and jail time. On Sunday, a Missouri street church that serves hot meals to the homeless was honored with a front-page feature in the St. Louis Post-Dispatch. On Monday, city health department officials took notice and told the group to immediately cease handing out food. For over a year, Churches on the Streets has served St. Louis’ homeless population. On Monday nights, dozens of the city’s more than 1,300 homeless people convene to share a hot meal and listen to a sermon from Edward “Pastor Paul” Gonnella, 50, whose own previous struggles with crack and prison give him credibility with those attendees facing similar issues. But on Monday, the St. Louis City Department of Health told Churches on the Streets that they must cease serving hot homemade meals because they lack a permit. ^^ Good grief, what is with you blame-the-victim-firsters? Are you people really that sick? Are you really that sadistic? And speaking of "animals," when stories like the above become an object of discussion, is that when those around you get to hear you blab about how farmers "domesticate" wild pigs by offering them free food -- the obvious implication being that human beings are the moral equivalent of animals? If so, then whether you like it or not, and whether you want to admit it or not, your'e not nearly as "different" from the abortion-promoting "liberals" as you so proudly proclaim to be. Deal with it. Associated Press reports that around 80 percent of all Americans deal with joblessness, near poverty, or reliance on welfare at some point in their lives. An increasingly globalized U.S. economy, the widening gap between rich and poor and loss of good-paying manufacturing jobs [are the likely] reasons for the trend. The risks of poverty also have been increasing in recent decades, particularly among people ages 35-55, coinciding with widening income inequality. Washington may pay lip service to reducing inequality. But – as we will show below – bad government policy is largely responsible. 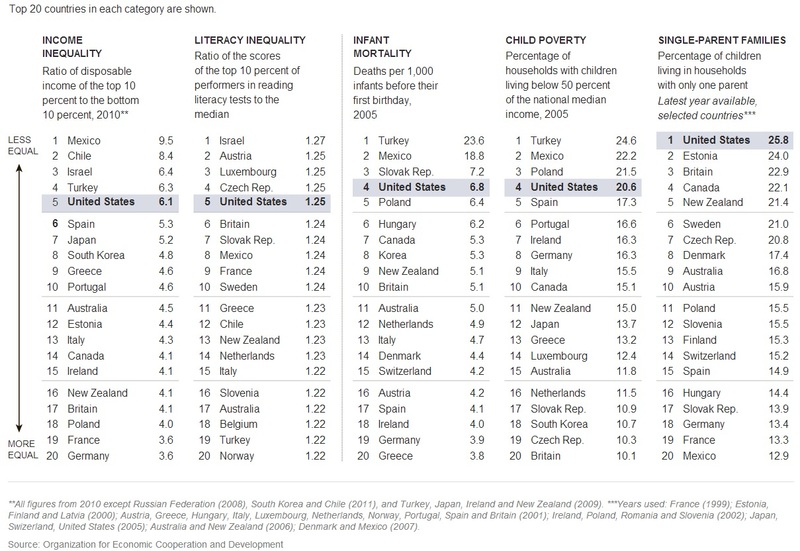 But inequality in America today is actually twice as bad as in ancient Rome, worse than it was in in Tsarist Russia, Gilded Age America, modern Egypt, Tunisia or Yemen, many banana republics in Latin America, and worse than experienced by slaves in 1774 colonial America. 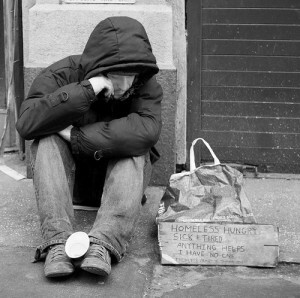 Perhaps the best way to define poverty is to listen to people who considered themselves poor. I attempted to do that in 1994 and 1995, working with a group of women from the Young Mothers Program in the South Bronx who agreed to help me with this book. Our first task was to define poverty. We sat in a circle of folding chairs, and we were all proper people, serious about the work. Sometimes the women were tired, for we met at the end of the day and they had frequently endured the unrelieved stress of a confrontation session. Now and then children came into the room, and there was rarely a time when someone in the group did not have an appointment to keep elsewhere, for the poor, as they said, do not choose their lives. In that way, the conversations we held were extraordinary, for there was nothing mandatory about them. Over time, the aspects of poverty, as described by the women, fell into categories: privation and oppression, which produced different feelings in them. Privation came first, told by H, a big woman, whose hair was dyed in a curious way, tiny blond braids on a cap of black. She had lost many teeth, so that her speech was both slurred and sibilant, and because her back was injured, she could not move with grace. Of all the women in the group, H wore the weariest clothes, the most ill-fitting clothes. In summer, her feet were tucked into ragged shoes, like bedroom slippers, but she gave the appearance of being barefoot. “Poor is a little girl who worked in the fields all day,” she said, remembering Barbados, where she was born. Her words came in the form of a litany, loud at first, diminishing, and finally lost in tears. “Poor is all day in the dirt. “Poor is too tired to eat. “Poor is walking barefoot on a tar road in the hot sun. “Poor is a house with no electricity. “Poor is no water in the house. “Poor is going outside to use the toilet. “Poor is not having a mother to take care of you. “Poor is being carried around in a fish basket when you’re a baby. Sobbing took her breath, and H could not speak any more. The little woman who sat beside her, dark and thin, wizened before she was thirty, rubbed her back and soothed her, cooed to her. It was a long time before anyone else spoke. She, too, silenced the room. Like H, she brought tears to the other women’s eyes, but no one touched M, no one soothed her. She sat alone, she made a distance between herself and the rest. Other women spoke of hunger and crowding, but hunger was the common thread. It sorrowed them, it debilitated them, it left them weeping. Hunger meant tragedy, a fate that could not be overcome no matter how they tried; hunger meant that nothing more could be found, it implied an end to dreaming. They resigned themselves to hunger, in the way that the dying no longer feel their pain. “Poor is homelessness,” P said. She looked around the room, as if to gather the agreement of the others, who set their jaws and looked ahead and nodded, for most had known the streets and the shelters; they could recall a night, a week, a season in the park. Nothing spoke so clearly of the relative world as homelessness; the word itself existed only to remark the existence of something better. A soldier’s anger came into the room, and remained, for relative poverty isolates the rich from the poor, the poor from each other. In the game, everyone plays against everyone else. There was no more touching. They turned to education; everyone agreed that lack of education was a form of poverty, but it produced no discussion, no passion, for education of the kind the winners know was too far away, which made it cool and beautiful but unreachable. No matter who tried to define poverty, the welfare department turned up as an aspect of being poor. C carried the discussion of the welfare system on to the issue of what wounded most deeply. She spoke, as always, in a blunt, irrefutable way, using words as if they were bludgeons made of mixed languages and Brooklyn streets. She was the one who found the heart of things, the bitter one, the one who had been to prison, who had touched the bottom the others feared. They studied her, as if to see how long she could avoid destruction. No woman could escape the question of the differential, the relativity described with such eloquence by the counter and the desk in the welfare office. C rescued her: “For me, I give an example. I’m on my own case budget, that’s what it’s called. I had my own apartment. They were only give me two fifteen. Where in the hell would I find a apartment for two fifteen unless it’s tore up? It would have to be all broken down. I feel that’s unfair, even though the welfare is always doin it. By starting us off and paying two fifteen a month, that’ll bring down our self-esteem even more. I have to move all the way, way into the ghetto, maybe where it starts.” Everyone laughed, even M. "...I am firmly convinced, as I have already said, that to effect any great social improvement, it is sympathy rather than self-interest, the sense of duty rather than the desire for self-advancement, that must be appealed to. Envy is akin to admiration, and it is the admiration that the rich and powerful excite which secures the perpetuation of aristocracies. Where tenpenny Jack looks with contempt upon ninepenny Joe, the social injustice which makes the masses of the people hewers of wood and drawers of water for a privileged few, has the strongest bulwarks." "In a society where unjust division of wealth gives the fruits of labor to those who do not labor, the classes who control the organs of public education and opinion—the classes to whom the many are accustomed to look for light and leading, must be loath to challenge the primary wrong, whatever it may be. This is inevitable, from the fact that the class of wealth and leisure, and consequently of culture and influence, must be, not the class which loses by the unjust distribution of wealth, but the class which (at least relatively) gains by it. "Wealth means power and ‘responsibility,’ while poverty means weakness and disrepute. So in such a society the class that leads and is looked up to, while it may be willing to tolerate vague generalities and impracticable proposals, must frown on any attempt to trace social evils to their real cause, since that is the cause that gives their class superiority. On the other hand, the class that suffers by these evils is, on that account, the ignorant and uninfluential class, the class that, from its own consciousness of inferiority, is prone to accept the teachings and imbibe the prejudices of the one above it; while the men of superior ability that arise within it and elbow their way to the front are constantly received into the ranks of the superior class and interested in its service, for this is the class that has rewards to give. Thus it is that social injustice so long endures and is so difficult to make head against. "You go back hundreds of years to sharecroppers. Economically, many historians wrote that...they were worse off than black slaves here in the U.S. Because the slave was supposedly property, you wanted to keep them alive. Sharecroppers died of malnutrition many times in bad years. And they had to sign a contract to buy their clothes, their sugar, their flour -- everything -- from the company store. You've heard the song, 'I owe my soul to the company store.' When the blacks got supposedly 'free' after the Civil War, many of them just became the lowest rung of the sharecroppers. Most Americans have ancestors who came over here as white slaves. Oh, it was only a seven-year indentured servitude, but you generally never got off of the plantation. 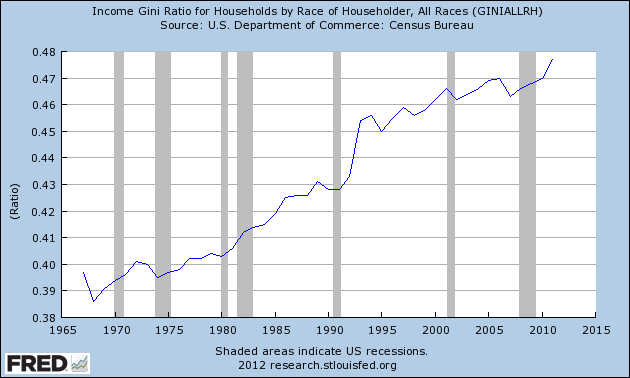 But, oh, don't worry, poor whites still enjoyed looking down on blacks. It's all about a snobbery: 'Oh, at least I get to look down on somebody.' And that's why only around 2% of whites in the colonies -- then later in the North and the South -- actually owned slaves, but over 90% (in surveys that were done at the time) of poor whites supported it early on...because they got to look down on somebody. And it wouldn't even matter if the black slave going and picking something up in town for the master was even healthier and had a little bit more fat on their belly than the sharecropper wearing rags, he could still order the black around. And, again, this is all what you see at the country clubs, and what you see in cliques in schools -- humans love tribal hierarchies. And the TSA and the government system and the corporate system gives them all these little power-tripping hierarchies to feed on people and to perch on top of them and control them." he program, in place since the recession started in 2008, provides up to 47 weeks of supplemental unemployment insurance payments to jobless people looking for work. Its expiration is expected to have far-reaching ramifications for the economy, cutting job growth by about 300,000 positions next year and pushing hundreds of thousands of households below the poverty line. But are taxpayer-financed "benefits" ending for corporate welfare recipients? Are they ending for war profiteers? Are they ending for the prison-industrial complex? Are they ending for the NSA's Soviet-style surveillance grid? And are either Wall Street Democrats OR "Tea Party" Republicans speaking a single word of protest against this shameful and inexcusable inversion of spending priorities? I'll let readers answer that question for themselves. NEW YORK -- David Torian is an Ivy League-educated lawyer and a onetime chief of staff to then-Rep. Michael McNulty (D-N.Y.). He has 23 years of experience in congressional and government relations, witnessed and practiced politics at the highest level, and has been well compensated along the way. On Dec. 28, he will also be among the 1.3 million Americans who will lose their long-term federal unemployment insurance benefits. Unemployment is not just a blue collar problem. As Torian's experience shows, it can affect even Beltway power players. And it comes without much, if any, warning. When the consulting firm that Torian worked for after his time on the Hill folded, there were few options available. He took time off to help his sister tend to their ailing mother, who died at the end of 2012. The Washington resident then went looking for work. While he found that his government affairs experience was a draw, his age, 49, was not. "I get interviews but lose out in the end because prospective employers tell me my experience makes me 'over-qualified' and they do not feel I would stay long in the position if it was offered," Torian told The Huffington Post. For over a year now, he has been receiving unemployment benefits as he tries to find a job. The benefits, roughly $430 a week, were set to last another few months. But he has been informed that his last check came this past Wednesday. "The whole experience of not working and looking for work has been extremely stressful on me. It’s a pride issue. It is an embarrassment issue, too. A lot of my casual friends don’t know I’m not working. I’m too embarrassed to tell them that I’m out of work and on unemployment insurance," he said. He had hesitated to talk on the record because of that. Already, he said, he's moved to a cheaper home, maxed out credit cards, and gone through his savings and 401(k) accounts. He's found some work on the side through a friend. But the income isn't enough. He figures that he can pay rent for three more months without the unemployment insurance. He's thought about looking for more blue collar work. But he has no background or skill set in those fields. "I’m in and out of depression mode," he said. "I will stay in my apartment for days without leaving. It’s emotionally draining." Unlike food stamps -- another safety net program that Congress likes to kick around -- Americans don't qualify for unemployment insurance by being poor. In fact, you can only qualify for unemployment benefits if you had a solid work history prior to being laid off. Will Heartless Republicans Screw Themselves By Screwing the Jobless? In 1934, when President Franklin Roosevelt first proposed the idea of unemployment insurance during the Depression, business lobby groups and their allies in the media and politics created an echo chamber to justify their opposition to this idea to cushion widespread hardship and help jumpstart the economy. James L. Donnelly of the Illinois Manufacturers Association testified before Congress that unemployment insurance "would undermine the fabric of our economic and social life by destroying initiative, discouraging thrift, and stifling individual responsibility." Unemployment insurance "places a premium on indolence," warned George C. Lucas of the Publishers Association, quoted in the Washington Post. An editorial in the Los Angeles Times warned that unemployment insurance would tempt Americans "to join the slacker and chiseler class." John Gall, representing the National Association of Manufacturers, warned that it would "kill off that spirit of individualism." Yesterday (Saturday), 1.3 million jobless Americans lost their unemployment benefits because Republicans in Congress refused to pay for extending them beyond 26 weeks. By mid-2014, another 1.9 million long-term unemployed workers and their families will exhaust their jobless benefits, bringing the number of jobless workers without benefits to 4.2 million. But if you think Republicans have a hard time sleeping because of the suffering they've caused, think again. To justify their callousness, they simply recycle the same arguments that their right-wing counterparts used eight decades ago. "If you extend it beyond [26 weeks], you do a disservice to these workers," Senator Rand Paul (R-Kentucky) recently told Fox News. "When you allow people to be on unemployment insurance for 99 weeks, you're causing them to become part of this perpetual unemployed group in our economy." During a hearing on unemployment insurance earlier this year, Rep. Jim Jordan, an Ohio Republican and chair of the House Subcommittee on Economic Growth, Job Creation and Regulatory Affairs, said: "If that's not a disincentive to work, I don't know what is." These statements reflect an odious blame-the-victim ideology. Last year Rep. Paul Ryan, the Wisconsin Republican who was Mitt Romney's VP running mate and now chairs the House Budget Committee, warned that jobless insurance and other safety net programs are a "hammock that lulls able-bodied people to lives of dependency and complacency, that drains them of their will and their incentive to make the most of their lives." So for the millionth time, would you please stop providing these authoritarian control-freaks a convenient foil against which to define themselves in the eyes of the bottom "47 percent"? Right before they left for the holidays, Republicans in the House of Representatives left a lump of coal in the stockings of 1.3 million Americans. On Saturday, long-term unemployment benefits for those struggling Americans expired, leaving them and their families to face the continuing fallout of the recession with nowhere to turn for assistance. While many have heard about the disastrous impact this will have on 1.3 million people and our entire economy, few are aware that a bipartisan solution was at hand. Republicans could have avoided this latest manufactured crisis by including the extension of unemployment benefits in the recently enacted budget and paying for it by ending unnecessary corporate welfare to big agribusiness companies. But Rep. Paul Ryan, leading the Republicans in the budget negotiations, refused. When the budget came to the floor of the House two weeks ago, I led a vote to reconsider extending unemployment insurance during debate on the rule. Every single Democrat voted to allow a three month extension of benefits to come to the floor -- yet only one solitary Republican was willing to cross the aisle to extend these critical benefits. Watch my speech from the House floor on extending unemployment benefits by clicking here. Republicans justified their position with a perverse logic -- that it builds character for people to go hungry and taking these benefits away will help people find work. This flies in the face of both the economic and moral implications of cutting off this emergency aid. The Congressional Budget Office estimates that because these benefits are injected directly into our economy, a failure to extend long-term unemployment benefits will mean the loss of 200,000 jobs. That means families looking for work will have fewer jobs to compete for and no benefits on which to fall back. The fact of the matter is that people receiving unemployment insurance, including 20,000 veterans, want to work and are actively looking for a job. In the United States of America, we believe in providing a lift up, not a kick while you are down. Unemployment insurance is that lift up. Rand Paul has lately been citing Rand Ghayad’s research as a reason to eliminate long-term unemployment benefits. Rand Ghayad replies, “You know nothing of my work.” Which is true: as the good Rand documents, it’s clear that neither the bad Rand nor anyone on his staff read beyond the opening sentence or two. And in general, the whole notion that the way to cure unemployment is to slash aid to the unemployed is an astonishing case of sloppy thinking allied to cruelty. What Ghayad showed was that employers are reluctant to hire workers who have been unemployed for a long time. Paul takes this as evidence that we need to make long-term unemployment even harder to endure than it is now, to force workers to get jobs sooner. What’s wrong with this idea? It’s fallacious at two levels. First, the notion that unemployment benefits have a major negative impact on job search is no longer supported by most labor economists. The papers right-wingers love to cite are, in general, two or more decades old; it’s now generally believed that much of the apparent effect of benefit expiration came from the way firms handled temporary layoffs, which are much less common than they used to be. Evidence from recent data shows much smaller effects. Second, and at a deeper level: The level of unemployment in America today has nothing to do with job search or the lack thereof. Think about it. It’s possible (though dubious) that an individual worker who is currently unemployed may increase his or her chances of getting a new job by engaging in heroic efforts — making hundreds of phone calls per week, expressing a willingness to accept minimum wage or less, whatever. But none of this gives employers any incentive to create a new job. All this worker can do is move closer to the head of the line, getting a job that would otherwise have gone to someone else. And the reason for this condition is that we have a depressed economy, where the number of jobs is limited by inadequate demand. ^^ Republicans in general, and "Tea Party" Republicans in particular, just don't get it, and apparently never will: the more they arrogantly wage "war on the poor" in the midst of a banker-engineered depression -- all while continuing to line the pockets of war profiteers and corporate welfare recipients (er, beg pardon, I meant "producers") -- the more they make Democrats look like, if nothing else, the "lesser evil" in the eyes of the bottom "47 percent." Then when they end up losing easily winnable elections as a result of this, they'll actually have the nerve to whine and complain.